Yet another hit riddim produced by mogul Johnny Wonder and created by super producer Adde Instrumental with "Smile For The World Riddim". The melodic feel good riddim features the hit title track from the beautiful star Denyque with "Smile For The World", Alkaline "Never End", Jah Vinci "Do It Again" and Butta with "Pure Gal". 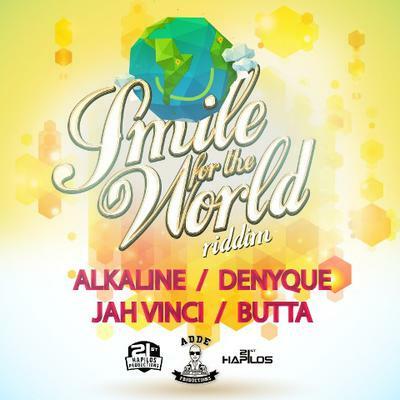 Distributed by 21st Hapilos Digital, "Smile For The World Riddim" is now available on itunes. 21st Hapilos Productions presents controversial blazing star Alkaline with "Things Take Time" from the "Black List Riddim" created by Adde Instrumental. Riding a wave of international success, Alkaline has recently returned to the island from a busy touring schedule. "Things Take Time is now available on itunes via 21st Hapilos Digital. Iconic dancehall superstar Vybz Kartel incarceration has not slowed down his musical life. He has been dominating the airwaves with a catalog of unreleased music from various producers and hitting the charts with such singles as "Have A Little More" produced by Kwshawna Records. The blazing single is available on itunes distributed by 21st Hapilos Digital. Bad Riddim". Fans will delight in this musical gift from Vybz Kartel long-time protégé. Distributed by 21st hapilos Digital, "Tan Bad" is now available on itunes. Boom Bangaz presents Chan Dizzy "Enjoy My Life". Since hitting the scene with various hits, Chan Dizzy hasn't slowed won "I have been working tirelessly in the studio building my catalogue of songs," he recently stated to the media. Distributed by 21st Hapilos, "Enjoy My Life" is available on itunes. Candy K the Newly crowned queen of the Magnum Kings and Queens competition is hard at work forging her musical path. Her newest single is her formal introduction as she performs "Me Name Candy K" produced by critically acclaimed UIM Records. The single is out now on itunes via 21st Hapilos Digital. Madd Unit Productions presents "Fun Time Riddim". The entertaining boisterous riddim features Konshens with "Gyal Wine Good", Busy Signal "Gimme Some Of Your Good Loving", Bling Dawg "Prayer", Munga "Money Pree" and "When You Wine", Demarco "Demarco In A Second", Blaqk Sheep "Brace Gyal", Kimanda "Let Him Know" and Tajji "All Out". "Fun Time Riddim" is now out on itunes distributed by 21st Hapilos Digital. Madd Unit Productions presents "Haunting Riddim". The star studded riddim features Sizzla with "Soon See", Gytian "Bruck Out", Delly Ranx "Crush Pon Mi", Liquid "Don't Want You Back", Munga "Prison Nuh Nice", Nitty Kutchie "She make Me Feel" and "Table Haffi Full", Versatile "Don't Bow Fi It" and Zellas "Watch Yuh Step". Distributed by 21st Hapilos Digital, the memorable "Haunting Riddim" is now available on itunes.